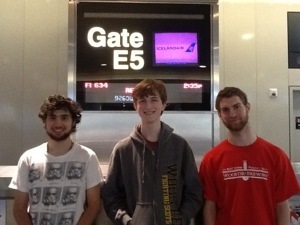 BOSTON, MA – A bleary-eyed Iceland group left Wooster at 4 am this morning to begin the journey to the land of fire and ice. We’ve arrived in Boston and are comfortably checked-in. We are patiently awaiting our flight to Keflavik airport, arguably the most geological airport in the world. Proof that we really are leaving for Iceland in two hours! From left to right are Adam Silverstein (’16), Michael Williams (’16), and Alex Hiatt (’13). The gate agent assures us that we’ll see lots of rocks in Iceland. We sure hope so! Follow our adventures on the blog for the next two weeks.